Own your very own apple tree! An apple tree for your family, your friends or your company! 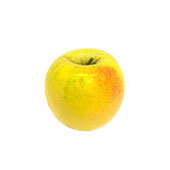 Here at Mogitore we have the perfect highland climate to grow many varieties of apples. 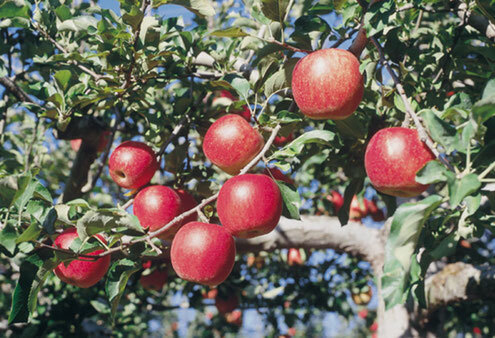 Now you can own your own apple tree! You'll get to take ownership of the whole growth cycle of your apple tree: see the white and pink flowers appear, thin the flowers and then finally harvest your apples. 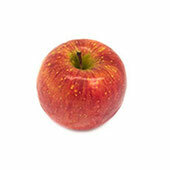 Apples with a juicy and light taste. 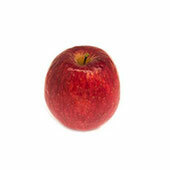 Apples with a characteristic dark red skin. 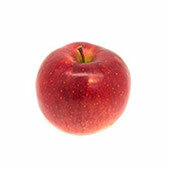 These apples are famous for a crispy mouthfeel. Large apples. These apples have a good size consistency, so they make great gifts. Apples with a honeycore. These are sweet apples that are also sold at markets. 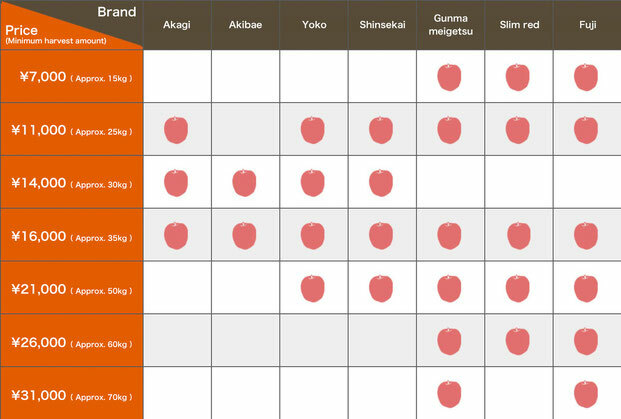 Apples representative of Gunma. 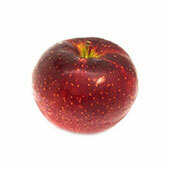 These apples are very famous for a rich fragrance and a honeycore that extends to half of the fruit. Slim and smaller apples as the name implies. 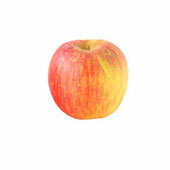 These apple are sweet and stay fresh for a long time. The classic. 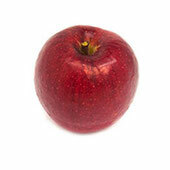 Apples with a superb balance of sweetness, sourness, and flavor that stay fresh for a long time. Although the amount your tree produces may vary due to the weather or the tree, each plan taken out with us includes a minimum harvest guarantee. * If you can't be here on harvest day, we will ask for you to pay a fee for us to box and send the minimum harvest amount to you. * If a natural disaster causes considerable damage, we are willing to provide refunds to customers who request them. * If a tree owner wants to exit their agreement before harvest, we can provide an 80% refund of their sign-up fee (to cover costs). In previous years we've been flooded with sign-ups for Gumna Meigetsu varieties on the first day, so we no longer have a "first come, first served" system. Now we run a lottery sign-up day at Mogitore in which the winners are picked at random. ① We only give lottery tickets to those who arrive before 10am on the day. ・Lottery ticket distribution starts from 9am. ・Each visitor may receive only one ticket per person. ② The lottery is run after the tickets have been handed out. ・This is run at the Garden Restaurant. It will be outside, so please wear warm clothing. ・We ask all that have received a lottery ticket to be present for the lottery. You are only eligible if you yourself are there on the day. ③ We ask those who won to choose their tree at the owners desk. ・Each winner may only choose one Gunma Meigetsu tree each. ・If you win but are not present when your number is called, you relinquish the rights to the tree. From 10am Monday February 5 you can sign up here at Mogitore or by phone (0278-64-2800). Please understand that tree numbers are limited. * We do not accept sign-ups by fax, email or post. * We only accept sign-ups through the methods listed and during the time-frames listed. * We have a limited number of trees, so sign-ups will end once we run out of trees. If you sign up at Mogitore, we ask that you finalize your agreement and payment here. If you sign up over the phone, we will send you a bank transfer request so you can pay by bank transfer. Once we have received payment, we will mail you a confirmation letter. Your agreement will be complete. You are welcome to visit us and look around to choose the tree that you like the best. If you sign up here at Mogitore, you can choose your tree right after you sign up. If you sign up over the phone, we will send you a notice in the mail after which you can let us know which day you would like to visit. Please contact us to arrange a day to visit. Sometimes you may choose your tree on the same day you do flower thinning. If you can't make it to Mogitore, we will choose a tree for you. * Tree choosing is only available to customers who have finalized their payment. * Visiting an orchard can be a bit dirty, so please wear appropriate clothes and shoes. Removing extra flowers reduces the stress put on the tree which means that each and every apple will get all the nutrients they need to become juicy and delicious. We will send you a notice in the mail when it's time to visit. Then you can let us know when you'd like to visit. Please contact us to arrange a day to visit. Sometimes you may do flower thinning on the same day you choose your tree. Flower thinning period: Throughout May ※"Youkou" variety will be around May 10. Although the amount your tree produces may vary due to the weather or the tree, the plan taken out with us includes a minimum harvest guarantee. Once it's time to harvest, we will send you a notice in the mail. 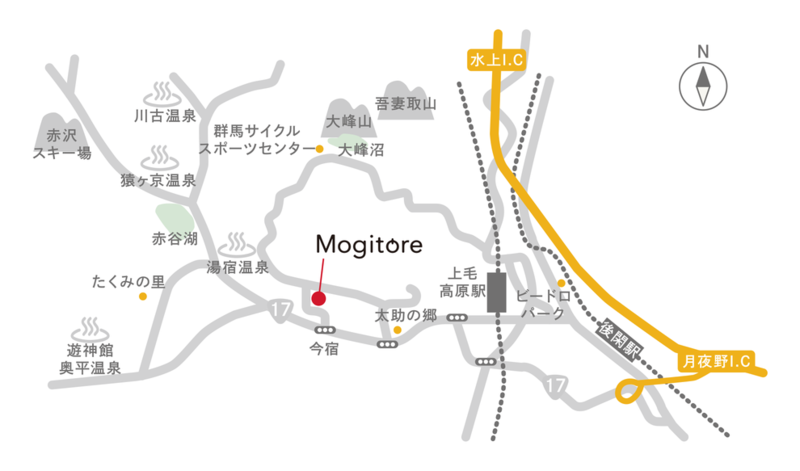 Please contact Mogitore to arrange a day to visit. If you can't be here on harvest day, we will ask for you to pay a fee for us to box and send the minimum harvest amount to you. Harvest: From early October to mid-November　* This varies due to the variety.